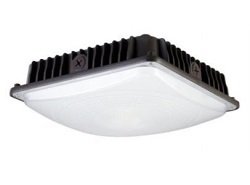 The NebuLite CPS Canopy Light is an architectural nice looking LED luminaire. Its unique Fresnel Lens offers glarefree wide beam spread that perfect for low ceiling parking structures. A battery backup option is available for this canopy light.